The vast range of styles, approaches and emotions generated in our paintings makes the art world such a wonderful place for us to explore. It never ceases to amaze me what an exciting world we have in the arts. I mention emotions in particular, for to respond with passion and feeling is vital in whatever genre we paint. Sure, we all do ‘bread and butter’ work, as it’s not easy maintaining that level of high emotion for our most important works. Emotion in art is often triggered by a sense of nostalgia, and one small, yet effective way of introducing this into landscape paintings is to include symbols of yesteryear, whether you are painting old sailing boats, steam locomotives, or whatever your theme may be. 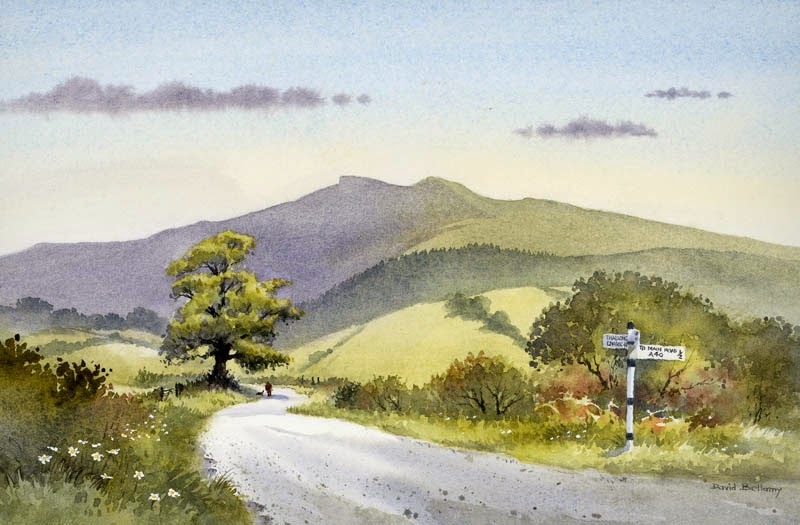 In this watercolour the old county road stretches away towards the Brecon Beacons, and on the right-hand side I have included the old sign-post that still stands there. This style of sign-post is slowly disappearing from the British countryside, and it’s amazing how including just a minor element like this can evoke a marvellous sense of the past. Watch out for these little gems if you like to put across this feeling of past times in your paintings. The signpost was created with masking fluid which will give you a strong, stark edge to the feature. This is one of several of my paintings now on display at the Ardent Gallery in the centre of Brecon, tel. 01874 610710 Pop in and treat yourself to a coffee there while you look at the Christmas show. 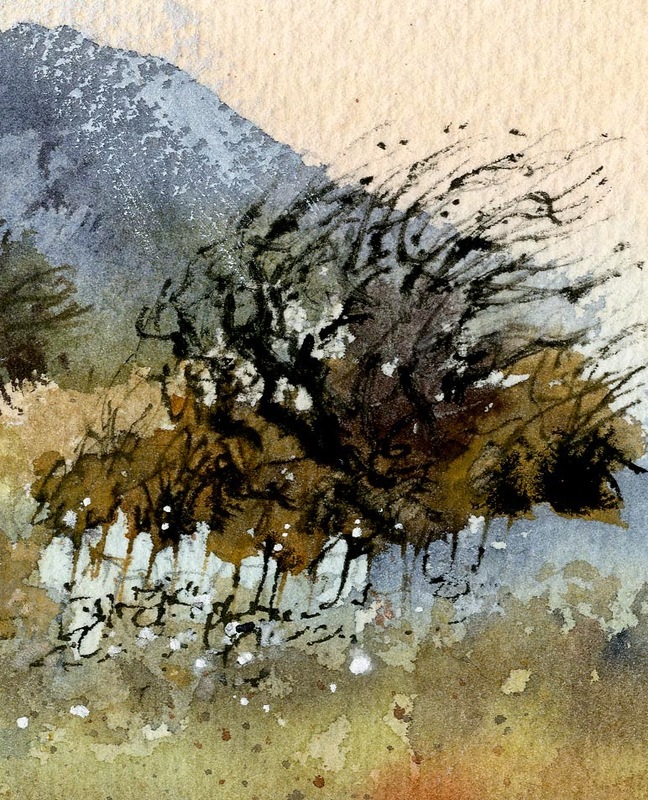 When it comes to undergrowth we can quite literally find ourselves with quite a thorny problem, and painting it seems no easier: how do you cope with all those similar, repetitive and often mundane shapes? Firstly, don’t dismiss those mundane bits of a scene: in a composition we need quiet, mundane passages in order to make the exciting bits stand out, so they are important parts of a painting. Secondly, when you are out in the countryside don’t forget to gather material like this for use in a painting, in sketch and photographic form. Now and again concentrate on these less dramatic features and deliberately record them carefully. This photograph taken on Strumble Head in gentle spring sunshine will give you an idea of what I mean by recording the less dramatic. 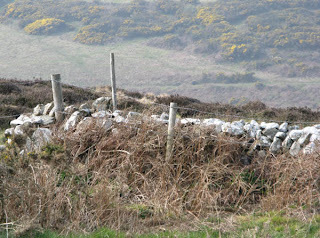 Posts, boulders, a dry-stone wall can break up the mass of undergrowth, as can a gate, tree, bush, rusty farm machinery, and so on. 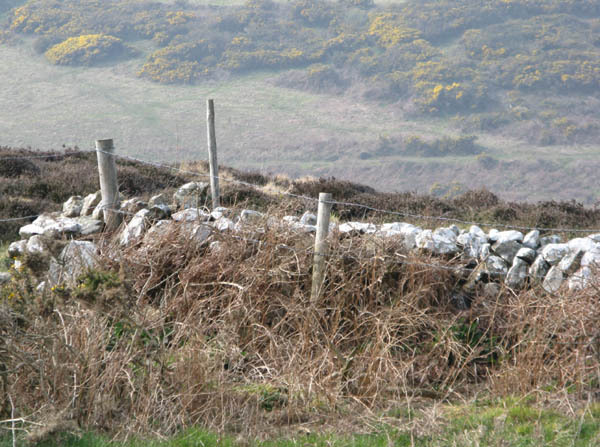 The undergrowth serves the extremely useful purpose of creating a lost-and-found effect here for the wall, which can look too strident if standing up above the ground by itself. Of course the wild tangle of vegetation needs simplification by reducing it to fewer detailed shapes. Make some of the grasses and briars stand out more than others. With vegetation the spatter technique of splashing blobs of paint from a brush can work very effectively. If you wish to beef it up, as you will do from time to time, one of the best methods is to introduce more variety of colour – red and orange can be particularly striking and I often carry this out by dropping these colours into an area that I’ve already wetted with clean water. Substitute detail with colour. 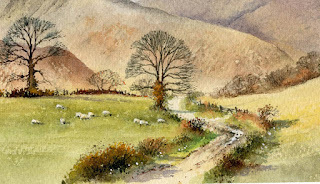 There is more on tackling vegetation in my Complete Guide to Watercolour Painting.